Last Monday our 5th Hangout session of Dungeon Crawl Classics RPG took place. Because of Real Life©, I’m more than ever running against the clock, without time for games or this blog, so running a 1-hour online game session was a blast for me (I probably gained back +3d6 Sanity). I have 4 players so far – with 2 others thinking about joining. We already got a game session with 22 characters “on screen” (between PCs and hirelings). The dynamics of running more than 1 PC are amazingly fun and I’m considering using in other games (and systems). 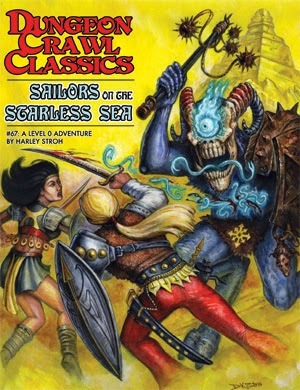 My players are still exploring the Chaos ruins from the Sailors on the Starless Sea. After a first attempt to breach the fallen fortress, they retreated to their home base to recover (a.k.a. Level Up). They managed to save a few prisoners, two of which became new fanatical followers (a pair of crazy ladies called Helga and Brigitte, already converted to the teachings of Azi Dahaka, Our Serpent Lord). I wanted for the dungeon (and the game in general) to feel alive and dynamic, so I plotted what would happen during the one week and a half that the party was away from the ruins. They managed to slew quite a few beastmen, including the minotaur champion. Because of that, the Master of the Citadel was aware of them, so I decided on two plans for the bad guys: first, they raided another village to get more beastman stock; second, the Master executed a eldritch ritual to summon a “Seed of the Great Old Ones” and threw it against the party. What was this seed? A Cthulhoid aberration that was awaken from the Depths and started to dig after the party. 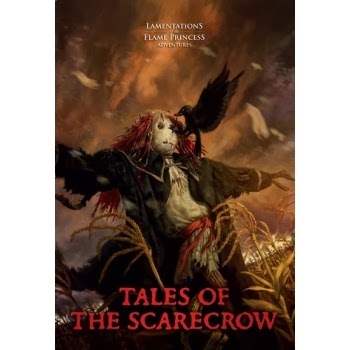 In other words, I used the short set piece Tales of the Scarecrow, from the awesome Lamentations of the Flame Princess. While traveling to the Chaos ruins the party found a mysterious farm, where the Seed awaited for them. After a harrowing encounter, and few deaths, the players managed to escape, taking with them two dangerous magic items (The Sword Which Is Uncertain and the creepy grimoire Malleus Deus) and a lone survivor (and unknown to the players, also a recently transformed ghoul-like creature). The group eventually learned about the survivor’s weird behavior and left him on the road (with, of course, will ensure lots of encounters in the future, as our ghoul NPC will hunt the party to get his magic sword back). Righter after combat, the party’s zealot (Chaotic cleric) of Azi Dahaka told me that he would try to raise the dwarf from the dead using a Divine Aid check. I warned him about the dangers, but he rolled anyway. The player rolled a 12 and burned all his Luck to get a 17. Then the party’s halfling burned a ton of Luck raising the check to amazing 25! 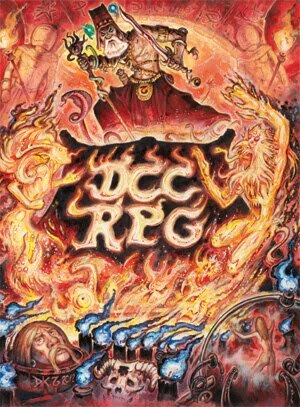 DCCRPG treats coming back from the dead as something unique – usually the plot of an entire adventure. What should I do? The idea was crazy and opened a dangerous precedent, but it was also something thrilling and fun. Besides, the players really put their resources on it. So I decided to do a raise dead they would love but eventually regret. After a gruesome ritual (the zealot PC described how he used harpy blood to channel the Powers of Chaos etc., it was awesome! ), a pallid and corpse-like dwarf stood up, with a horrid scar across his jaw (the harpy took it out when she killed him). 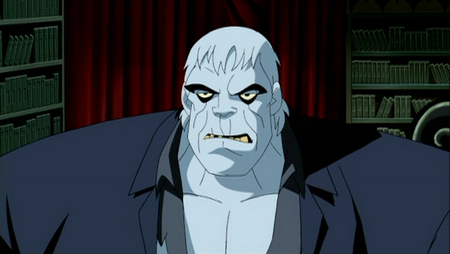 I aged the zealot prematurely (taking a few points of Strength and Stamina) and also drained a few points from the dwarf (which resulted in a funny situation… he now has Intelligence 3 and is role-played, basically, like Solomon Grundy). Finally – and without the party knowing it – I linked the life force of the zealot to the poor dwarf, just to let things more evil amusing. Of course, in addition to all that, now our lord Azi Dahaka demands a special quest from his ambitious zealot… maybe face the dreaded People of the Pit? P.S. 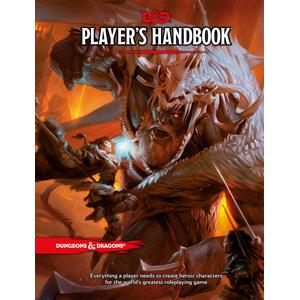 : A side commentary… the zealot PC now has an accumulated disapproval range of 11 on his divine powers and the party is still at the dungeon’s door. Checking the Divine Disapproval Table I was expecting apocalyptical consequences if such player attempted any spellcasting (after all he can roll 11d4 of divine wrath). I was disappointed with the results. Most are just ‘meh’ and won’t trouble the player at all I guess. So I’m thinking to creatre a personalized Disapproval Table for my Azi Dahaka cleric (or just to create a few 20+ effects). If I can accomplish this I’ll post the table here.